Core and cut the cabbage into thin strips. In a large bowl, toss the cabbage, 1/4 cup cilantro, scallions, vinegar, and 1/2 teas salt. Set aside until ready to serve. Meanwhile, whisk the mayo, 1 tbs cilantro, minced chipotles, lime juice, and garlic. Season with salt and pepper and set aside. Preheat your charcoal grill with a layer of ash coated lit charcoal. Allow the grill grate to heat 5 minutes. Clean and oil the grate. Whisk the chili powder, coriander, cumin, and a bit of salt and pepper in a bowl. Pat the fish dry and rub with the remaining vegetable oil. Using your fingers, gently rub the fish with the spice mixture. When the grill is ready, arrange the fish over the grate and cook for about 10 - 14 minutes, carefully flipping once halfway through cook time. Remove the fish from the grill and let rest, covered with foil, for 5 minutes before serving. Heat the tortillas on the grill in batches and wrap in foil or a clean kitchen towel to keep warm. Slice the fish into long strips. 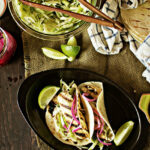 Serve the tortillas with a slathering of the mayo chipotle sauce, cabbage, and fish. Top with pickled onions if desired.